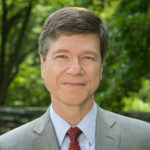 Jeffrey D. Sachs is the Director of The Earth Institute, Quetelet Professor of Sustainable Development, and Professor of Health Policy and Management at Columbia University. He is Special Advisor to United Nations Secretary-General Ban Ki-moon on the Millennium Development Goals, having held the same position under former UN Secretary-General Kofi Annan. He is Director of the UN Sustainable Development Solutions Network. He is co-founder and Chief Strategist of Millennium Promise Alliance, and is director of the Millennium Villages Project. Sachs is also one of the Secretary-General’s MDG Advocates, and a Commissioner of the ITU/UNESCO Broadband Commission for Development. He has authored three New York Times bestsellers in the past seven years: The End of Poverty (2005), Common Wealth: Economics for a Crowded Planet (2008), and The Price of Civilization (2011). His most recent book is To Move the World: JFK’s Quest for Peace (2013). In this public lecture Jeffrey Sachs spoke about his upcoming book, The Age of Sustainable Development.